JOEL BAKER NORTHCUTT was born 28 Jan 1814 in Rutherford County, TN (Source: Letter written by Leeama Attaway Ewing. 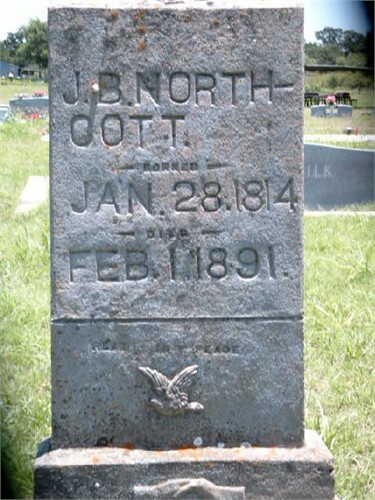 ), and died 01 Feb 1891 in Comanche County, TX. He was the son of William Northcutt and Sarah Williams. He married (1) MARY G. RALPH 10 May 1838 in Rutherford County, Tennessee (Source: Family Data Collection – Marriages.). She was born Abt. 1821 in Rutherford County, TN (Source: Family Data Collection – Births. ), and died Bet. 1854 – 1859 in Marion County, Arkansas. He married (2) MANERVA JANE HUDSON Bef. 1860, daughter of JESSE HUDSON and MATILDA EVERETT. She was born 15 Dec 1832 in Georges Creek, Marion County, Arkansas, and died 27 Dec 1912 in McCulloch County, TX. Minerva and William Wood had one son, George. William was one of the victims of the Mountain Meadows Massacre in 1857. After his death, Minerva married Joel Northcott. Manerva Jane Hudson was born to Matilda and Jesse Hudson in the George’s Creek community in Marion County on 13 December 1832. In the early 1850s she married William Edward Wood, who became one of the victims of the Mountain Meadows Massacre. Manerva had been left in Arkansas because she was expecting a child. The child, born after William’s death, was named George Edward Wood. He was born in 1855 and eventually died in Comanche County, Texas. A few years later, around 1859, Manerva married Joel Baker Northcott, a widower with six children. One of his daughters, Sarah, had married Manerva’s brother William Haney Hudson several years before. When Manerva married Joel, they moved with their children from George’s Creek to the Sugar Loaf community in northwestern Marion County. They had three children. On 15 September 1874 the family moved to a farm near White Rock, Texas. They made subsequent moves to Comanche and to Calf Creek in McCulloch County, where Manerva died in November of 1918. 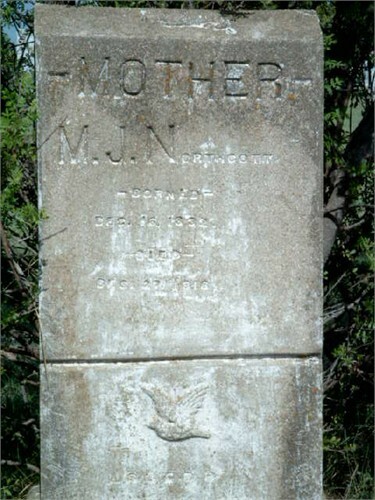 She is buried in Calf Creek Cemetery; Joel is buried in Downing, Texas.